We arrived in the evening, and after having found a cute hotel in the old centre, we went for a stroll. 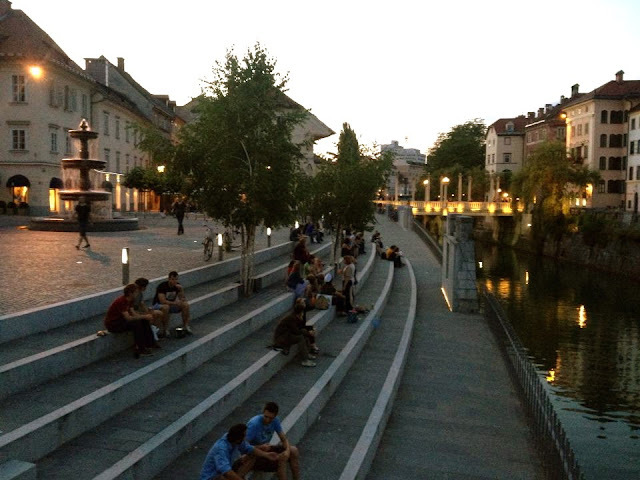 Ljubljana is incredibly lively in the evening. As you can see below, people were sitting at the water, chatting, having a beer, simply relaxing. There were also musicians playing cool music, and everyone just seemed happy. 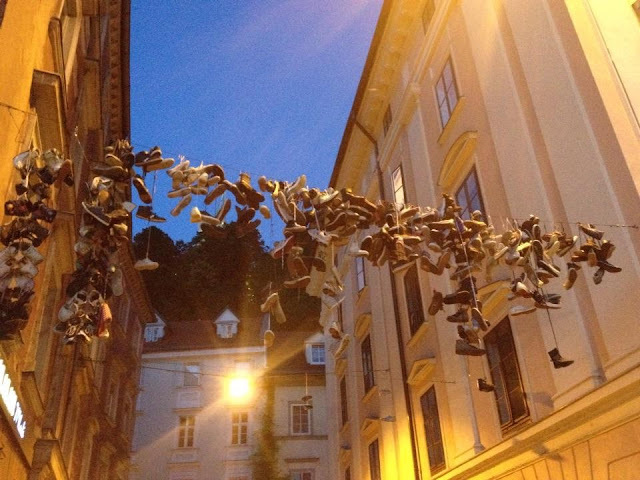 Throwing your shoes on the line is meant to bring you luck. I think people in Ljubljana are very lucky then! The city was very clean and well-kept. It was so cosy, and along the water there were plenty of bars which were full of people, and it was a Monday night! While looking for a hotel earlier, we walked past this restaurant where we smelled truffle. So of course we couldn't resist heading there for dinner. 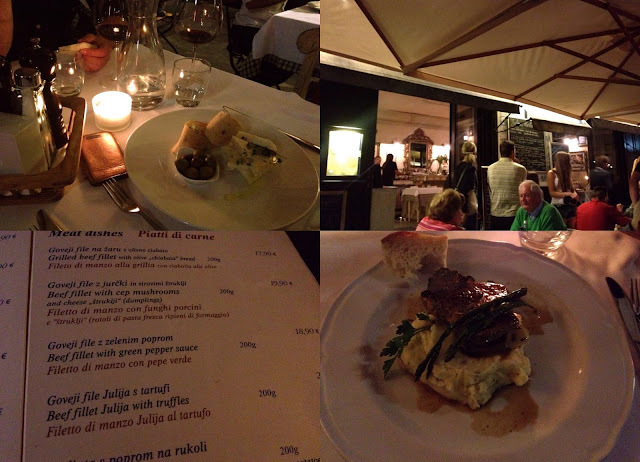 The restaurant, located in a street full of other little restaurants and across from Romeo's, was called Julija's. Everything on the menu looked good (there were some traditional Slovenian options too), but I quickly decided to have beef fillet Julia with truffle. We also shared a side of our favourite porcino/cep mushrooms. Everything we had was really delicious! Definitely an address to remember. With satisfied tummies, we returned to our hotel which was just a few steps away. We were lucky to find such a homely and comfortable hotel right in the centre of old Ljubljana. Lesar Hotel Angel is a lovely place which feels more like a home than a hotel. We had the very top floor to ourselves, with two large rooms, bathrooms and the softest beds (those thick, soft German duvets that I love). 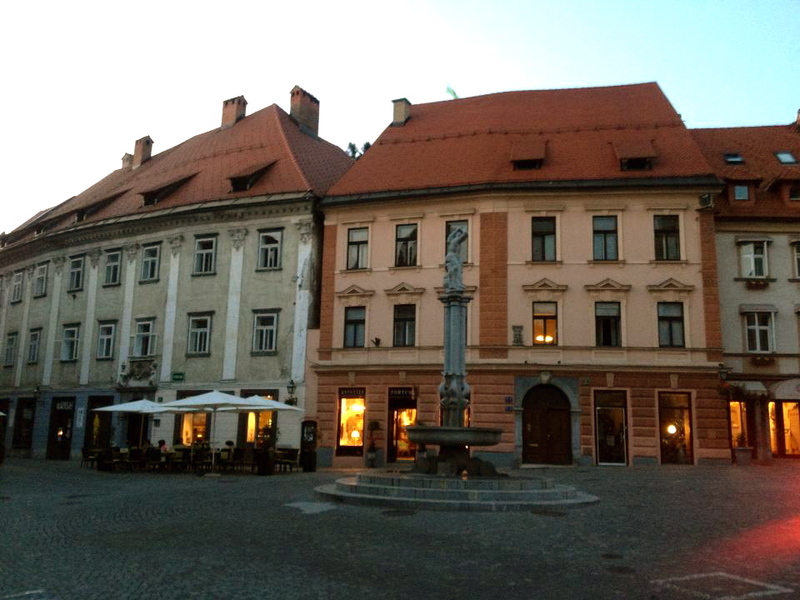 On our first and last day in Ljubljana, I woke up early and went down for breakfast. The croissants (which I don't like to eat) were apparently the best ones my brother and sister ever had (my brother had 4!). I ate fresh fruit and pancakes! Always good to start your day with pancakes, right? After brekkie we went to explore Ljubljana in the little time we had left before the long journey home. This is the street of our hotel. The whole old town looked pretty much like this: clean, cute and cosy. I loved it! After having bought some pears and figs for on the way, we walked over the Dragon bridge (Zmjaski Most). I spotted the cute loaves of bread in a shop on our way to Tivoli Park. Before leaving my sister and I quickly went into DM, which is a Slovenian (?) drugstore. I love drugstores in other countries and this one had so many brands I didn't know of. Especially a lot of organic/natural brands at low prices. We walked back to our hotel through the street where we had dinner the previous night. Look how cosy! I think we were all pleasantly surprised by Ljubljana and I will be coming back to this lovely city for sure. It's the perfect place for a short weekend city trip when you want to do something different than Paris, Prague, Berlin, etc. 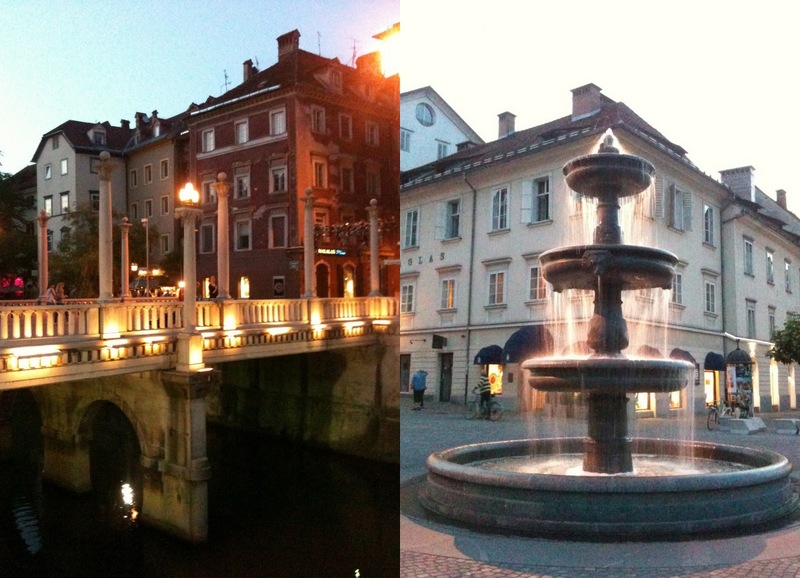 The old part of Ljubljana is the cutest, most well-kept and clean towns I've ever seen.